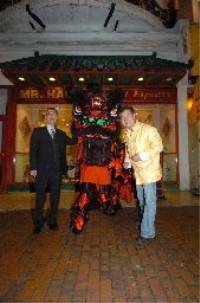 The Chinese New Year was celebrated with a spectacular performance outside Mr Hau's restaurant on Monday. A crowd of customers and local residents gathered in Terminus Road to watch Lion Dancers perform to the sound of drums and cymbals and fortune cookies were handed out. The ceremony heralded the Year of the Ox.